The cellulose based NatureFlex compostable film from Innovia Films is being used by Pistol & Burnes, a leading Canadian coffee roasting company to pack their Farmer First brand of coffee. 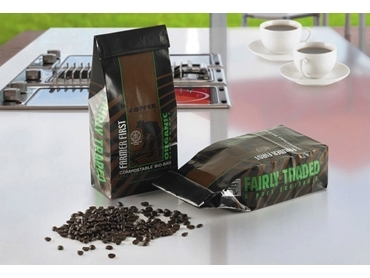 The Fair Trade organic coffee is packed in a paper bag laminated with transparent NatureFlex compostable film. According to Roy M. Hardy, President, Pistol & Burnes, most roasted coffee sold in the world is packaged in either foil bags (coated in plastic) or paper bags (with a plastic liner), which usually end up in a landfill as they are difficult to recycle. However, Pistol & Burnes’ Farmer First coffee is packed in an enviro-friendly coffee bag that can be organically composted in a home compost bin. NatureFlex compostable films are certified to meet the American ASTM D6400, European EN13432 and Australian AS4736 standards for compostable packaging. The wood pulp is sourced from managed plantations and the renewable bio-based content of NatureFlex films is typically 95% by weight of material according to ASTM D6866. The bags were developed by Genpak, a Canadian-based converter. Bill Reilly, Technical Manager explained that NatureFlex was recommended to Pistol & Burnes for several reasons including good technical performance, high barrier properties and superior seal integrity that enhance shelf life by keeping oxygen out and aroma inside the pack. Additionally, NatureFlex is perfectly aligned with the ethos of their Fair Trade organic Farmer First brand. NatureFlex is an obvious solution for use in this application as the film begins life as a natural product (wood) and breaks down at the end of its lifecycle in a home compost bin (or industrial compost environment) within a matter of weeks. It is also confirmed as suitable for emerging 'waste to energy' techniques such as anaerobic digestion.